The only Turtle in this comic is the one you see right there on the cover. Also, I think Danger Girl fights some tentacle monsters or something, but really? Danger Girl? 1996 was a long time ago, people. *This story is continued from Infestation 2 #1. 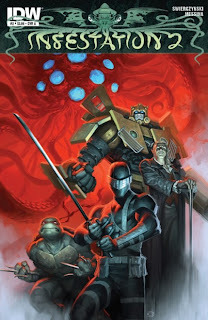 *The Turtles recently wrapped up dealing with the Lovecraftian menace in Infestation 2: TMNT #2. So yeah, I'm just kinda throwing this up here for completion's sake. While the Turtles warranted a one-panel cameo in Infestation 2 #1, they didn't even get that in this bookending chapter of IDW's crossover event. if you're a completionist, then I suppose you could pick the thing up, but it's $4 bucks. Why would anybody pay $4 bucks for a Danger Girl comic? 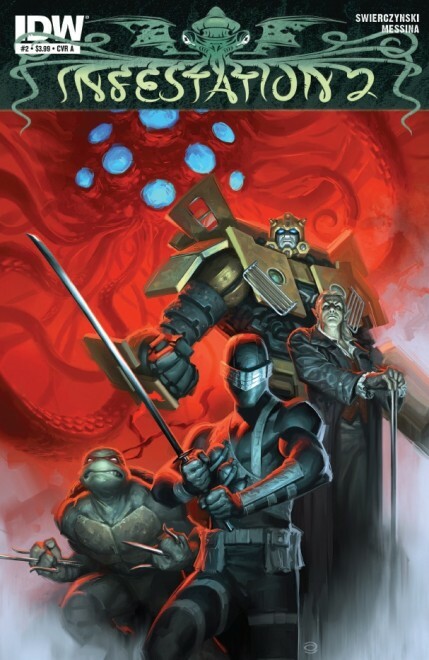 Awesome posting as I was just yesterday wondering about the different color versions of the early tmnt.